Finding good deals on furniture is something that not many people know how to do, and when it comes to modern furniture, you’ll find you have to narrow down your search even more. Fortunately, there are a few great methods to use to make sure the offers you find are the best deals in town, as well as the most advantageous deals that apply to online purchases. Not everyone enjoys buying furniture online. You have to order it and pay shipping costs, and when it comes down to delivering it and climbing it up the stairs, the delivery people might bail out and let you do all the work. Of course, there are ways to ensure this never happens, but you have to pay a lot more for that, or know the online store you’re using is 100% trustworthy. If you don’t want to go into all that, it might be best to stick to local stores. In that case, your options might be narrowed down, but you will have full, fast access to the furniture items you want to buy. Moreover, by checking local stores after the holidays or buying outside the season for certain types of furniture (for example, purchasing patio furniture during the wintertime), you can get an excellent deal on most of the modern furniture items you’re looking at. On the other hand, if you decided to purchase your furniture online, you have a lot more options and a better opportunity to score a great bargain on modern furniture. You will, however, have to be smart about your choices. While buying during a different season might work, you might not always find the furniture items in question on stock. However, there are still special deals and coupons you can use to land an excellent bargain from time to time. 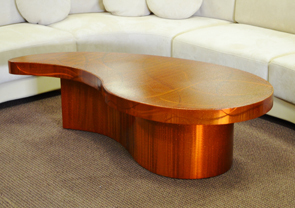 One great way to score a good bargain is to buy your furniture based on the material that it’s made from. Most modern furniture can be found in metal or glass, and traditional furniture is usually made from wood – although there are also many modern furniture items that use wood. The smart thing to do is focus on furniture items that are almost always made from a certain material (for example, metal), and learn all about them. For example, you will probably find that a metal coffee table will be sturdy, unique, and long lasting. Once you did your research, and you know all about the various styles, prices and potential problems associated with the type of furniture and the material in question, you can assess your situation in a better way, and spot the best modern furniture at a discount. Modern furniture doesn’t have to be as sophisticated and expensive as it sounds. In fact, in some cases it’s quite minimal and inexpensive. A good example is choosing the wine barrel style, which – although won’t provide you with the all-time cheapest discounts – is a lot more affordable than other types of modern furniture. You’ll find there are many other options to choose from, as long as you play your cards right. To make sure you get a great deal, however, always aim for the more practical choice first, and avoid flimsy furniture items that you might have to repair or replace quite soon after you bought them.